The spinal cord functions as a sophisticated network that carries information from the outer elements of the body (skin, muscles, ligaments, joints) through the sensory tracts, to the central “computer,” the brain. Data are processed there, and new information such as muscle control is sent out through the motor tracts of the spinal cord. 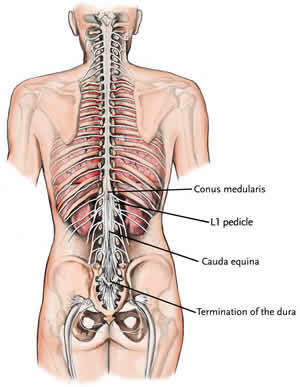 The spinal cord ends as the conus medullaris at the L1 vertebral level, where it branches into the cauda equina, a collection of nerves that extend from the conus medularis to the sacrum. The conus medularis nerves float freely in spinal fluid, making it possible to pass a needle safely into the area to draw a sample of spinal fluid or inject drugs, anesthetics, or radiologic substances for X-ray, MRI or CT scan.